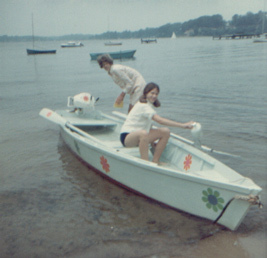 Sally in the Summer of 1970. Sally had several dachshunds growing up. Their exploits gave her hours of fun, in addition to living not but a quarter mile from the Severn River. Sally recieved first collegiate education at Western Maryland College (which has sadly since then seen it's name changed to McDaniel College), graduating in 1977 with a BA in Biology. There he met her life's love Jim Wogsland, whom she soon married. The beautiful college grad. Christmas with Packie and Bradley. The couple soon had a son, Bradley. Sally worked at first, but soon they had another son, Patrick, and she decided to put off her career to raise them. Soon a daughter, Jaime, was born as well. Sally worked hard to raise her children as the family moved from Maryland to Pennsylvania to California and finally to Georgia. When Bradley reached High School, Sally decided to finally pursue her lifelong dream and became a nurse. She entered Kennesaw State University and four years later, in 1997, graduated with a 4.0 as an RN. Since then she has worked at North Fulton Regional Hospital and loves it. In 1997 Sally also became a grandmother, as Bradley left home to start a family. In 1999 her son Packie also went off to college. In 2002 her son Bradley and his family moved into the basement just before Jaime went off to college. Sally enjoyed having her two granddaughters so close, and then the birth of her grandson. She was saddened in 2004 when Bradley moved his family to Tennessee, ironically the first and last to leave the nest. Sally and Jim also have two dogs, Lucy and Maggie, who are their babies now that all their kids are gone. 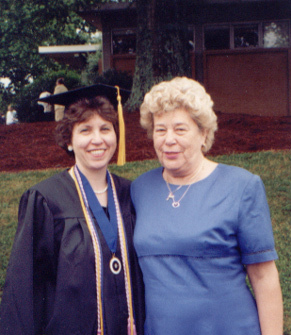 Sally with her mother at her Kennesaw graduation. Bradley James Wogsland 1979 - ? Patrick Andrew Wogsland 1981 - ? Jaime Beth Wogsland 1984 - ? Last Modified: 11 May 2005 by Bradley James Wogsland.